Since everyone is caught up in the Downton Abbey era, I thought an elegant manor house dinner might be jolly good fun. Send a very formal printed invitation with a monogram and gold edges, of course, and ask guests to dress in elegant Edwardian attire. 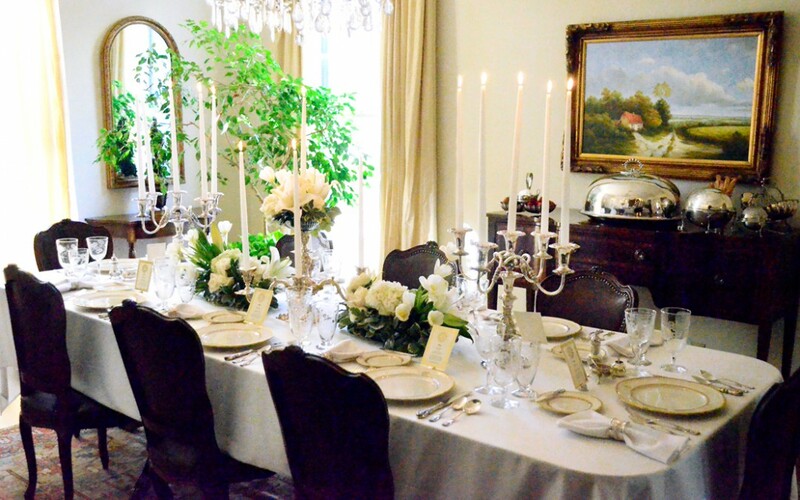 Set the table with crisp white linens, silver candelabras with tall white candles, and an abundance of beautiful fresh flowers in silver bowls. Add monogrammed china (this can be done with gold stickers from the craft store), sterling silver flatware for each course, and etched and cut crystal goblets. 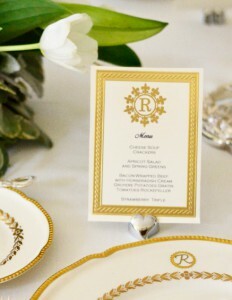 Place monogrammed, gold-rimmed menu cards (printed on your computer and monogrammed with stamps or stickers) above each plate along with individual antique silver salt cellars with tiny salt spoons, pepper shakers, and mustard pots. Have a butler (your husband) in a tux with white gloves welcome guests at the door of the mansion with a little bow. In a large saucepan over medium heat, sauté onions and celery in margarine until tender. Stir in flour. Add soup, chicken broth, and Tabasco. Stir in Velveeta until melted. Add shredded Cheddar, and stir until combined. Add milk, salt and peppers. Simmer for 20 minutes. For marinade, in a bowl, combine oil, vinegar, lemon juice, soy sauce, Worcestershire sauce, and lemon pepper seasoning. Pour over roast in a large glass baking dish. Refrigerate for 24 hours, turning once. Remove from refrigerator for 1 hour. Preheat oven to 275 degrees. Bake uncovered in marinade for 3 hours. Chill several hours or overnight. Remove and slice thin. 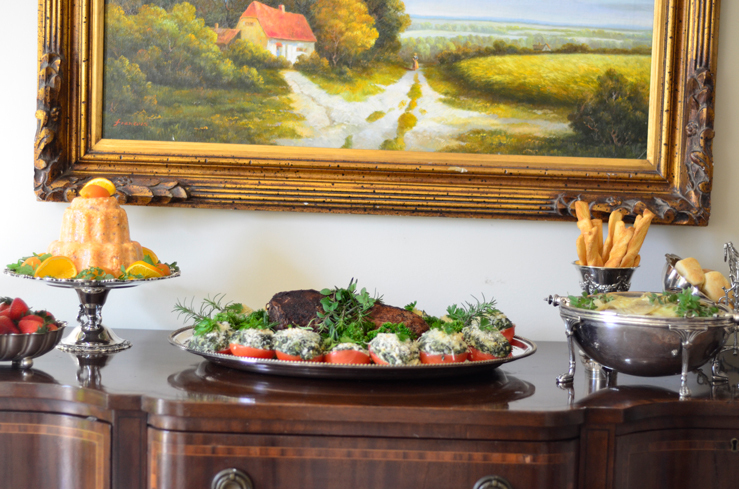 Warm and serve with heated marinade or Horseradish Cream. With mixer, beat whipping cream at medium speed until soft peaks form. Fold in remaining ingredients. Serve immediately, or cover and chill up to 8 hours. Preheat oven to 350 degrees. Peel potatoes and slice thin using the slicing blade of the food processor or slice about ¼ inch thick. Layer and cover with cream, and sprinkle with seasonings between layers. Top with cheese. Bake for 45 minutes. Remove from oven and allow to rest for 10 to 15 minutes before serving. Preheat oven to 350 degrees. With mixer, beat cream cheese until creamy. Add mayonnaise, and beat until combined. Stir in Parmesan and Romano cheeses. Add seasoned salt and pepper. Add spinach and artichoke hearts. Mound 2 tablespoons on top of each tomato half. Sprinkle each half with Mozzarella cheese and breadcrumbs. Place on a foil-lined baking sheet. Bake for 15 minutes, covered with foil. Remove foil and bake for 10 minutes. Prepare lemon pudding according to package directions; chill. Slice strawberries, reserving a dozen small berries with leaves for garnish. With cold mixing bowl and beater, beat cream until soft peaks form. Beat in sugar 1 tablespoon at a time until dissolved. Beat in vanilla. Line edges of each individual compote with 4 ladyfingers. Place one ladyfinger in the bottom of each compote. Layer each compote with 1Â½ tablespoons lemon pudding, sliced strawberries, 1 tablespoon whipped cream, another ladyfinger, and repeat layers ending with whipped cream. 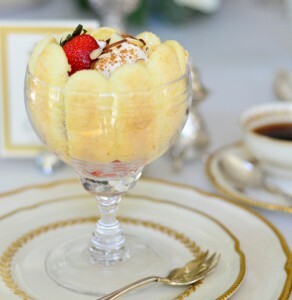 Sprinkle with cookies and almonds and top each dessert with a strawberry.